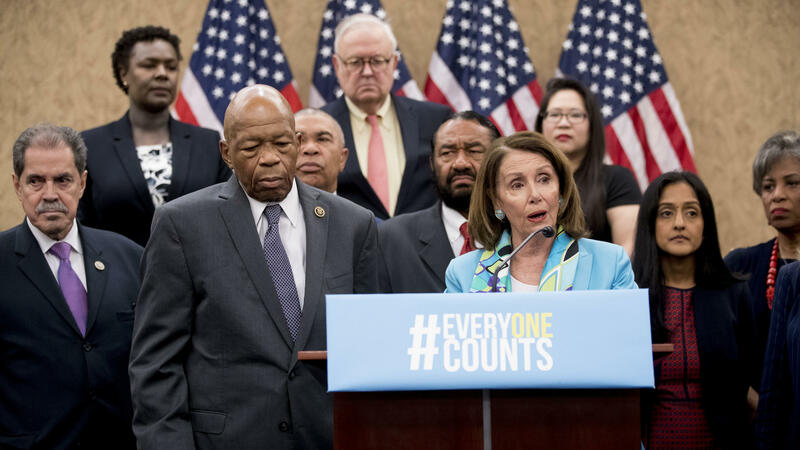 Nancy Pelosi of California (third from right), now House speaker, joins fellow Democrats, including Reps. José Serrano of New York and Elijah Cummings of Maryland, as well as other census advocates at a May 2018 press conference in Washington, D.C., about the new citizenship question on the 2020 census. The last stretch before the start of the 2020 census is upon us. The once-a-decade, national head count is scheduled to kick off next January. Census workers start in the village of Toksook Bay and other parts of rural Alaska when the ground there is frozen enough for door-to-door visits. Then, beginning in March 2020, the U.S. government's most expansive peacetime operation rolls out to households in the rest of the country. The data collected will be used for a major reset in political power and federal funding through 2030. Each state's share of representatives in Congress, as well as votes in the Electoral College, will be determined for the next decade by the new population counts. Those counts are also used to distribute more than $880 billion a year in federal funds for Medicare, schools and other public services, according to the latest estimate by The George Washington Institute of Public Policy. But before the government can carry out its constitutional mandate to count every person living in the country, it has plenty of hurdles to clear in 2019. Here are five of the most pressing questions surrounding the upcoming census. 1. Will there be enough money for the census? The Census Bureau is closed because of the government shutdown, but work for the 2020 census is continuing for now thanks to carryover funding from the 2018 omnibus spending bill President Trump signed in March. The bureau estimates that funding can last at least through March or into April with "no change to the schedule, cost, or scale" of the 2020 head count, according to a statement from the bureau's public information office. In case the shutdown lasts longer — as Trump has threatened — the Census Bureau has started looking into ways to "extend the length of the funds without notable programmatic slowdowns," the agency's statement says. Next year's head count is expected to be the most expensive in U.S. history. The Census Bureau estimates it will cost a total of $15.6 billion. Spending for the census is already ramping up as the bureau begins opening temporary local offices around the country this month and prepares to launch a national advertising campaign in January 2020. Last year, Congress significantly boosted funding for the agency, reversing years of lawmakers not matching the funding levels agency officials said they would need. Past funding uncertainty has forced the bureau to cancel some field tests for the census, including ones designed to work out the logistics of counting rural areas and collecting Spanish-language responses. Now, census advocates are watching to see if the census gets caught in a prolonged funding stalemate with the partial federal government shutdown – a scenario that could impact the hiring of census workers, advertising plans and IT systems preparations for the first online U.S. census. 2. What will happen to plans to add a citizenship question? The Trump administration is fighting seven lawsuits over a hotly-contested question it added to the 2020 census last year – "Is this person a citizen of the United States?" While the administration insists the Justice Department wants responses to the question to help protect the voting rights of racial and language minorities, more than two dozen states and cities, plus other critics, worry the question will discourage households with noncitizens, including unauthorized immigrants, from participating in the census. In the two lead lawsuits in New York, a federal judge has ordered the Trump administration to stop its plan to add the question. The legal battle is expected to make its way to the Supreme Court this year. Whether the question stays or goes has to be finalized by June, the Census Bureau says, so that printing the paper questionnaires can be completed without disrupting the tight deadlines leading up to 2020. As the issue winds its way through the courts, some Democrats in Congress are exploring other ways to stop the administration's plans. One possibility is including language in a spending bill that would defund the question. "Whether through the appropriations process, the courts, or elsewhere, we must act to make sure an untested citizenship question is not on the 2020 Census," says Democratic Rep. José Serrano of New York — who now chairs the House Appropriations subcommittee that funds the census — in a written statement. Another front to watch is the Democrat-controlled House Committee on Oversight and Reform. Its newly-named chair, Rep. Elijah Cummings of Maryland, says he plans to investigate why Commerce Secretary Wilbur Ross, who oversees the census, approved adding the question. "Secretary Ross told Congress it was all the Justice Department's idea when evidence indicates he orchestrated the whole thing," Cummings says in a written statement. "We will get to the bottom of this issue." Testimony by Ross at a congressional hearing, as well as any internal documents lawmakers uncover, could be used against the Trump administration in the citizenship question lawsuits. "We'll be watching closely and listening intently to any subsequent representations that Ross makes to the public," says Kristen Clarke, president and executive director of the National Lawyers' Committee for Civil Rights Under Law, which is representing plaintiffs in one of the California-based lawsuits. So far, Ross has avoided having to sit for questioning under oath by the plaintiffs' attorneys. The Supreme Court was planning to weigh in on whether Ross can be deposed for the lawsuits, but the justices cancelled oral arguments after the ruling by the federal judge in New York neutralized the issue. If the citizenship question does stay on the 2020 census forms, the responses collected could dramatically reshape the political maps of some states and local communities. According to a Federal Register notice submitted by the Commerce Department in December, the Census Bureau is planning to ask state and local officials in charge of redistricting whether they want citizenship data from the 2020 census. That data, if it becomes available, could be used to redraw voting districts based on the number of U.S. citizens rather than on all residents regardless of citizenship. 3. Is the first online U.S. census prepared for cybersecurity threats? To cut down on costs and keep up with the digital age we're living in, the Census Bureau is preparing to allow all households to submit their 2020 census responses through the internet. The new convenience, however, has raised questions about whether the Census Bureau is prepared for the potential risk to people's privacy. "Because the 2020 Census involves collecting personal information from over a hundred million households across the country, it will be important that the Bureau addresses system security weaknesses in a timely manner and ensures that risks are at an acceptable level before systems are deployed," investigators at the Government Accountability Office wrote in a recent report. Last June, the Census Bureau identified close to 3,100 security weaknesses in the IT systems for the 2020 census, according to the report. The bureau is preparing for potential problem scenarios, including denial-of-service attacks that crash the online questionnaire, fake websites impersonating the Census Bureau, and hacking of phones, laptops and other electronic devices used by the bureau's employees. Officials, however, say they're not planning to go into the details with the public. "We have not shared our plans for cybersecurity with the public intentionally to not give the opposing team, adversaries wanting to discredit the federal government, an advantage," the Census Bureau's chief information officer, Kevin Smith, wrote in a blog post in August. 4. Can the Census Bureau hire enough census workers? For the last census in 2010, the U.S. government hired about 635,000 temporary workers to collect responses in person from households that did not complete or mail back a census form. Help will be wanted again in 2020, but the low unemployment rate is putting pressure on the Census Bureau's recruiting efforts. Using iPhones to enter and submit people's information online is expected to help census workers be more productive in the field. Still, the bureau is planning to launch an advertising campaign targeting not only unemployed workers but also those who are already working and have evenings and weekends free. "If you're paying any attention to the news, teachers are complaining about needing to make more money," Albert Fontenot, the Census Bureau's head of the 2020 census, said during a public meeting in October. "Teachers love to do the census. It's a great opportunity for them to partake in democracy and be able to tell their students about what they do." 5. Will the census undercount communities of color and other hard-to-count populations? The Census Bureau is charged with counting every person living in the U.S. every 10 years. But some populations have been more difficult to tally up accurately than others. In 2010, the bureau over-counted white people who did not identify as Hispanic, while net undercounting close to 2.1 percent of black residents and 1.5 percent of Latino residents — or more than 1.5 million people in total — according to estimates from a Census Bureau study. The bureau is trying to overcome this challenge of reaching "hard-to-count" groups, in part, by increasing the number of languages that responses can be submitted in and starting to hire workers to coordinate outreach efforts with local organizations earlier than it did for the 2010 census. Still, the NAACP is leading a lawsuit alleging that the Census Bureau's "deficient" preparations for 2020 risk a "massive undercount" of communities of color, according to its complaint. The Trump administration has asked a federal judge in Maryland to dismiss the case. Critics of the citizenship question are concerned that asking about U.S. citizenship status will jeopardize the accuracy of the information collected, especially data about many hard-to-count populations. Beginning in June, the bureau is planning to conduct the first-ever field test of a 2020 census form with the citizenship question. Results, officials say, will inform decisions on whether to hire more census workers and adapt the 2020 census marketing campaign due to any negative response to the question. Some census advocates are worried that a citizenship question would deter community groups from helping to promote the census. "The @uscensusbureau should be praying for these [citizenship question] lawsuits to succeed. They cannot expect that the 'trusted messengers' like @NALEO will do their job for them!" wrote Arturo Vargas, the CEO of the National Association of Latino Elected and Appointed Officials, in a tweet in September. Last November, an email released as part of the citizenship question lawsuits alarmed some community groups preparing to drum up public interest in the census. Federal law prohibits the release of an individual's census responses until 72 years after the data are collected. But concerns about confidentiality surfaced after the internal email revealed a Justice Department discussion about the possibility of "renewed debate" over whether the Patriot Act, passed after the Sept. 11 terrorist attacks, could force individuals' confidential census responses to be released earlier.